In this article, originally published on the CRASSH website, Dr Rory Finnin - University Lecturer and Director of the Cambridge Ukrainian Studies programme - addresses the banning by Russia of the public commemoration of the deportation of the Tatars in illegally annexed Crimea. On 18 May 1944 a young Crimean Tatar poet named Idris Asanin began a torturous journey to Central Asia at the gunpoint of Stalin’s secret police, the NKVD. Along with hundreds of thousands of other Crimean Tatars, a Turkic-speaking Sunni Muslim people indigenous to Crimea, Asanin’s family endured an ordeal of mass death and brutal dispossession that claimed the lives of at least thirty percent of the entire population, mainly women, children and the elderly. Thirty percent – that is thirty times the percentage of the British population killed in the Second World War. This week, as we mark seventy years since the deportation of the Crimean Tatars, Asanin’s question resounds with a tragic new relevance. After struggling for generations to return to and resettle on the Black Sea peninsula, the Crimean Tatars are now under new threat from ‘local authorities’ under the nominal jurisdiction of the Russian Federation, which illegally occupied and annexed Crimea from Ukraine in March. Many have fled to mainland Ukraine since the annexation, becoming the largest community of IDPs (Internally Displaced Persons) in the country. And only days ago, the Crimean Tatars were even forbidden by decree to gather in public and commemorate the deportation and its victims. On 18 May 2014, they had to break the law to mourn and honour their dead. The Crimean Tatars defied the prohibition without – somehow – succumbing to rage. Disavowing religious and political extremism, they have engaged for decades in a committed practice of non-violent resistance against state injustice and oppression. In the late 1980s they prevailed over the Soviet system and won the right to return to Crimea. (In the post-Soviet period, this return from exile was financed by the Ukrainian state. In 1999 alone, for instance, Kyiv allocated twenty million hryven – approximately five million US dollars – to fund Crimean Tatar resettlement programs and attendant infrastructure projects.) Today’s prohibitions and provocations are nothing the Crimean Tatars cannot overcome. But the resilient dignity of the Crimean Tatar people should not exempt us from outrage. In Britain our public understanding of the present war between Russia and Ukraine – and make no mistake, it is a war – has been clouded by a relentless Kremlin propaganda campaign and by Western media ignorance of a complex ‘theatre’ of conflict. A casual observer seeking to make sense of the diplomatic recriminations, ubiquitous balaclavas, and proxy violence at this point may be tempted to throw her hands up in exasperation and confusion. To navigate between rhetoric and reality and understand what is generally happening along the eastern border of the EU, simply look to the case of the Crimean Tatars since the Russian annexation. The reality is that Crimean Tatar civil society and identity are under cruel assault, while the rhetoric from the Kremlin would have us believe otherwise. Only days ago, on Friday 16 May, Vladimir Putin sat down with selected Crimean Tatars in Sochi to mark the anniversary of the ‘inhuman’ (beschelovechnaia) deportation, announcing that the new ‘local authorities [in Crimea] are ready to work’ with them. At that very moment, these ‘local authorities’ in Crimea did exactly the opposite. Sergei Aksenov, the new ‘head’ of the Crimean government known as ‘Goblin’ in the criminal underworld, outlawed all public demonstrations in the entire territory of Crimea until 6 June. The purported reason was fear of potential ‘provocations’ from ‘extremists’ tied to the violence in ‘Ukraine’s south-east’. Keep in mind that the interim Ukrainian government in Kyiv – which has actual cause to fear mass gatherings at the moment – has issued no such kind of blanket prohibition on public assembly. In fact, over the weekend of 17-18 May, the Ukrainian capital and other Ukrainian cities were host to a series of solemn public events commemorating the seventy years since the Crimean Tatar Sürgün. The real reason for Aksenov’s decree was fear of the content, form and number of the commemorative events being organized by the Crimean Tatar community in Simferopol, Bakhchisarai and beyond. These demonstrations were a powerful refutation of the neo-Soviet pageantry resurgent in Crimea and the Russian Federation. They recalled the atrocities of Stalinism and restored many of the names, faces and stories of its victims. 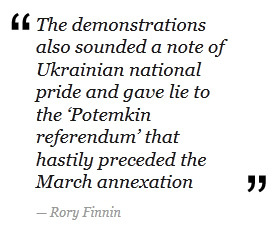 The demonstrations also sounded a note of Ukrainian national pride and gave lie to the ‘Potemkin referendum’ that hastily preceded the March annexation. There is a saying: naibilshymy ukraintsiamy v Krymu ie krymski tatary. ‘The greatest Ukrainians in Crimea are the Crimean Tatars.’ The vast majority of Crimean Tatars, who comprise more than 12% of the population, recognise Crimea as a part of independent, sovereign Ukraine. They identify overwhelmingly with the Ukrainian national project. And on Sunday, 18 May they made ubiquitous the national flag, the kök bayraq, which evokes the Ukrainian yellow and blue. Undaunted in the face of such intimidation, they also chanted ‘Mustafa! Mustafa!’ They were calling for the man who has prominently represented them for many decades, the seventy year-old Mustafa Dzhemiliev (Mustafa Cemiloğlu, aka Mustafa Abdülcemil Qırımoğlu). He was in Kyiv on this solemn day, and not by choice. Dzhemiliev is presently not allowed to set foot in Crimea. The Kremlin’s ‘authorities’ are in effect subjecting him to a new exile. Although physically diminutive, Dzhemiliev is a giant. As a child, he survived the deportation; as a young man, he survived the Gulag, enduring a 303-day hunger strike in the mid-1970s that garnered headlines around the world. In 1989 he made an emotional return to the ancestral homeland that he fought his entire life to see. To separate this man from his home today is an extreme injustice, yet it is Dzhemiliev and his compatriots who must fend off accusations of ‘extremism’. On 3 May, when Dzhemiliev attempted to cross at Armiansk from mainland Ukraine into Crimea, many hundreds of Crimean Tatars pushed past Russian troops to meet him. The new Prosecutor-General of Crimea characterized this abortive encounter at the border as an ‘extremist action’ and threatened to dissolve the Crimean Tatar parliament, the Mejlis, in recompense. The Kremlin’s ‘local authorities’ then made a more targeted threat against Dzhemiliev as well: last week his residence was among a number of Crimean Tatar houses searched by the Russian Security Service (FSB) for evidence of ‘terrorism’. The incident led to the hospitalization of his wife, Safinar Dzhemilieva. In war, wrote Carl von Clausewitz, ‘all action takes place, so to speak, in a kind of twilight.’ Information is elusive and unreliable, suspended between recessive daylight and an encroaching darkness of ignorance, confusion and deception. In Crimea, this darkness has lifted; in Donbas, it has grown. What we now see is that the Kremlin’s presumed gains on the Black Sea peninsula have already meant very real losses for the long-suffering indigenous people of the Black Sea peninsula. Seventy years after Sürgün, the question returns: how to bear it all?